The system is designed to keep track of links to their sites on the Internet. You probably know how important these days are links from other websites to yours. It is mainly thanks to them and appropriately selected and edited content page trunks in Google results. The system allows you to add links to your site and forget about checking every few days if they even exist at all. You receive a letter e-mail sent from the system and anything you do not have to worry about. You no longer have to spend hours checking work that can be done by machine. Maybe you are positioning the company web site and would like to have someone you that is done in a continuous viewing pages, would you like someone to do it for you. This system is for just such people. It will save you time and money. Instead of checking you have the time to grow your business, and all you get for your e-mail. For the system you only pay once and you can use it at will, instead of paying the company a monthly installment. The system does it for you, you do not have to do anything. Just a few steps, and every day you will receive on your e-mail a full report. The number of projects is unlimited, you can add them as much as you want. 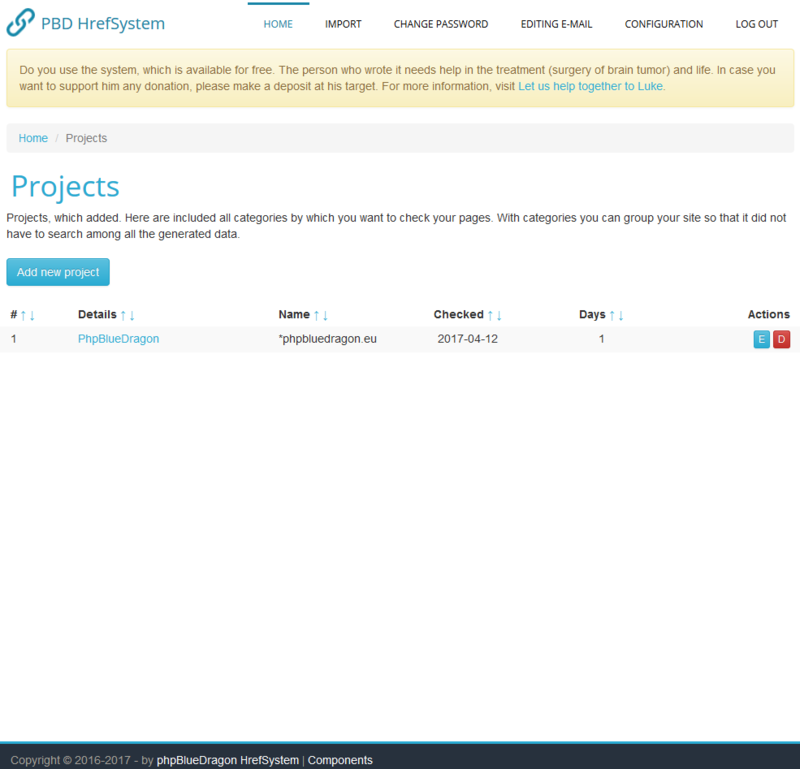 With projects of your site and reports will be grouped. Adding more links is time consuming. Therefore, the program is able to import them from CSV file (TXT). One click and all the links are added to the project. Yourself can choose the number of days at which the system will automatically check whether there are links given on pages. You fill out one form and you can forget. With a view to preparing the way based on layers and classes will be readable on any device connected to the Internet. You can at any time check the results looked like at any time through the archives, which also gives you the ability to sort results. My dream has always been to emerge in a series of films with a description of nature and animals as he does Sir David Frederick Attenborough . All the time I watch various materials on discovering a way of life of various species. From birds, through the mammals, insects, and fish. The first thing is a house, or rather flat in the block where I would not walk on the coal into the basement, and then bring it to the apartment on the first floor. I always have dark circles after it has been healthy eye - it's tiring for me, unfortunately I can not otherwise solve the problem. I'd like to at home it was so I do not have to watch the stove or not to come out of the smoke. I would like to eventually be able to go to rehabilitation, to bring my body into better condition. Lots of it.